Dan Waters’ article, Hong Kong’s Hongs with Long Histories and British Connections, includes the following information about The Hongkong and China Gas Company. The article appeared in the Journal of the Royal Asiatic Society Hong Kong in 1990. Dan has written several articles directly for our Group. HF: The queries are mine. I have also added the images. “William Glen, who had no knowledge of the gas industry in 1861, obtained from the then Governor, Sir Hercules Robinson (when the population was 123,281), a concession to supply gas to the city of Victoria. The company was incorporated on May 31st 1862: most of the shareholders lived in the United Kingdom, although 500 shares were offered locally. Then, on December 3rd 1864, Hong Kong was lit with gas for the first time by about 15 miles of mains and 500 lamps, in Queen’s Road extending up the hill to Upper Albert Road. Previously, the only street lights had been installed voluntarily by residents, and burned peanut oil. The residents of Caine Road complained that they Journal of the Royal Asiatic Society Hong Kong Branch were still in darkness. Kowloon had to wait another 28 years before gas lights were turned on. The inhabitants there continued to depend upon candles and oil lamps. The board of directors set up their office in London, and from there they engaged staff and ran the company. The first manager in Hong Kong was Robert Christopher Whitty [thanks to Mark Bailey for providing his full name]. It was he who erected the plant, which came from Britain, on the waterfront at West Point (near Whitty Street, named after him). [Shek Tong Tsui] It was the first gas utility in the Far East. 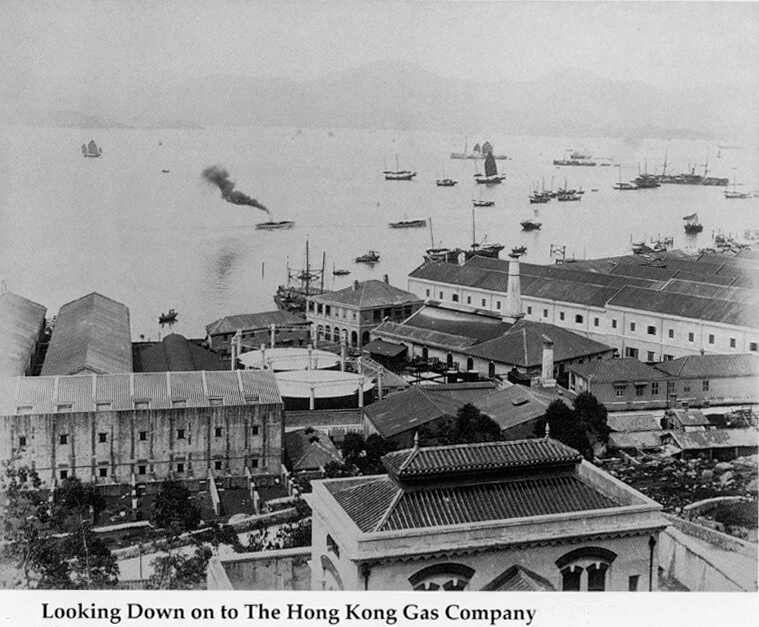 Jardine’s office, the Hong Kong Dispensary (A.S. Watson and Company), and the Hong Kong Hotel were the first buildings to be lighted by gas. 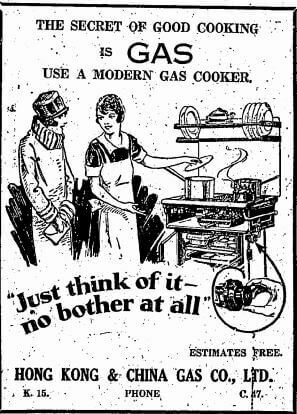 Gas cookers and waterheaters were still unheard of. The book, Signs of a Colonial Era, notes that Whitty was “Builder and Manager” of HK and China Gas Works at West Point. I wonder whether this means he was actually the building architect, contractor etc…? And can anyone provide information about the man or an image? 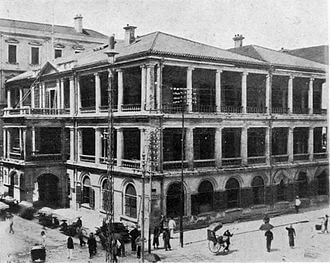 This photograph from the early 1900s show the first Jardine House. 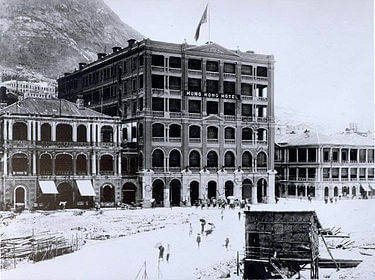 The Hong Kong Hotel was HK’s first luxury hotel and opened on Queen’s Road and Pedder Street in 1868. The first plant could manufacture 120,000 cubic feet of gas a day, and for 80 years coal was used as fuel. The Ma Tau Kok gasworks used to ring a brass bell at hourly intervals, like ships of old using the marine system of two, four, six and eight bells over a four hour period, for timing the charging and discharging of furnaces. This bell was a familar sound to Ma Tau Kok residents. For 90 years the company was managed directly from Britain. Then, in 1954, majority control was purchased by George Marden of Wheelock Marden. In 1982, transfer of the company’s corporate registration from England to Hong Kong made it a local firm. These moves brought about more effective management control. For 100 years there were gas lights in Hong Kong. Today only four remain. These are situated at the head and foot of the broad granite steps, built between 1875 and 1889, which lead from Ice House Street into Duddell Street in Central. The lamps were installed at the turn of the century when they were lit manually. These steps and the four street lights have been gazetted as historical monuments. Once there were over 2,000 street gas lamps. This article was first posted on 1st October 2014. Robert Christopher Witty is my 4x great Uncle. I do not have a photo as I am actually trying to find out information myself as to what may have happened there on the 30th of september 1864 . On that day Ellen Witty his wife and her brother Henry Alcock Simpson a builder/ bricklayer , my 4x great grandfather were killed at the gas works . they are both buried in happy valley cemetery in hong kong. I do know that Robert returned back to london not long after and died in London in 1870. An interesting question to which I don’t know the answer, is what the provenance is of the gasometer that still stands (and I believe is in use for stand-by storage) back from the Tin Wan Praya waterfront just outside the Aberdeen Typhoon Shelter West entrance (on the north shore). I’m fairly sure it’s been there as long as I can remember (and that’s over 40 years) and its general look suggests something that is decades old, though possibly post-war. Has anyone any knowledge of this? It would seem a likely candidate for HK industrial archaeology status.